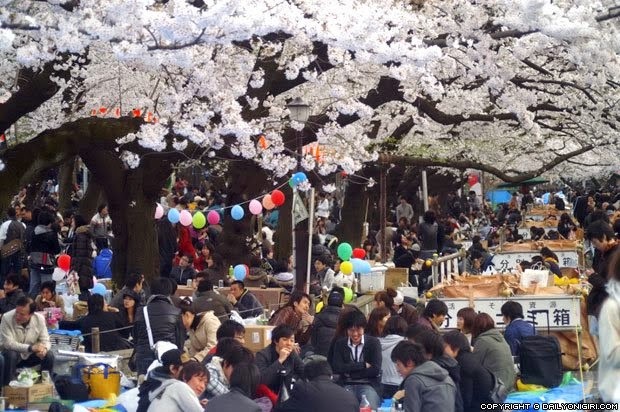 The hanami party is as much part of the annual cycle of the seasons in Japan as are Golden Week shopping and being stuck in the Obon U-turn rush. Hanami refers to the viewing of the cherry blossoms that bloom in late March and early April marking the end of the long, cold Winter and the onset of Spring with the warmer weather to come. It also usually marks unexpected rainstorms and the end of under floor heating until needed again in November. However, it has to be said that Japan knows how to party and when the weather turns, the parks will be filled not so much with purveyors of beautiful flora but the bon viveurs of Asahi Super Dry and Kirin Lager Beer. Friends will have organised a gathering in a favoured location and will spend the day enjoying each others company. The main park in Shinjuku actually tries to ban alcohol and suddenly young mothers with babies become popular as they sneak the bottles in under the push pram blankets. As ever the atmosphere will be relaxed and jovial, some may even bring mobile karaoke systems but no one will play music so loud as to annoy anyone else. Those partaking of the event a little too much will be wrapped in coats and allowed to sleep it off while the festivities continue into the night. And at the end of the day everyone will pack up their litter in carefully separated recycle bags and in the morning you would never know anything had happened at all. And then it starts all over again. I had a pretty loose event planning vision and was willing to let the experts do their work and my planner handled that beautifully - I would bet on her being able to perfectly execute a more detailed-oriented vision as well.